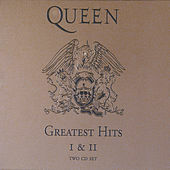 This retrospective, released in 1995, is the sturdiest single package of Queen hits, drawing its track listing from the band's hits in the U.S. and their native England. Though some obscure favorites are omitted, this is ideal for the new Queen enthusiast who wants to go well beyond banging their head along to "Bohemian Rhapsody." 1992 Hollywood Records , Inc.